Whenever I was pregnant I made a lot of mistakes, nothing huge with terrible consequences but a series of things I kick myself for now. Firstly, there was the obvious ones – buying too many baby clothes and getting far too stressed comparing the developmental benefits of various playmats. If I ever do it again I will chill out, I will honestly. But, more importantly, I was a martyr. I tried to be the hero and didn’t look after myself. I didn’t slow down to enjoy the experience and treat myself. I was so busy getting ‘ready’ and thinking about baby that I forgot about myself almost entirely. I have a hunch that this is pretty common behaviour but it really has to stop. Pregnant women, stop worrying about your baby and start thinking of yourself. There is a time and a place to be selfish and that time is now. Your baby is being monitored by professionals, thought of by family and friends, spoilt rotten with gifts carefully chosen and dreamt about by you. That baby is on someones mind almost 24hours a day. And guess what, when they’re born, that little bundle will be pretty much anyone talks about for at least 6 months. The fourth trimester is coming in hot and you will soon be wrapped up in nappies, googling curious rashes and doing laundry faster than you can say wonder weeks. Now is the time for you. Take care of yourself. Go to bed early, don’t fall asleep in front of the TV every night. Get your hair done, even if money is tight treat yourself to a Groupon voucher. Buy comfortable clothes, I know you’ve bought your baby 90+ outfits for their first year so you deserve more than three for your pregnancy. And crucially, when people ask how you’re doing don’t be afraid to be honest. If you’re scared, nervous, tired, frustrated then find a friend you can talk to. Be it your mum, your partner, your midwife, someone in you due date forum. Find somebody you can be candid with about how you are really doing. Your mental health is just as important as your physical health, if not more. Antenatal depression and anxiety are just as valid as post-natal and they can come knocking any anyones door. Take the time to process how you’re feeling, to look after yourself and be mindful of your moods and symptoms. It’s totally normal to be on edge or more anxious but it’s important to recognise when those feelings become a problem. 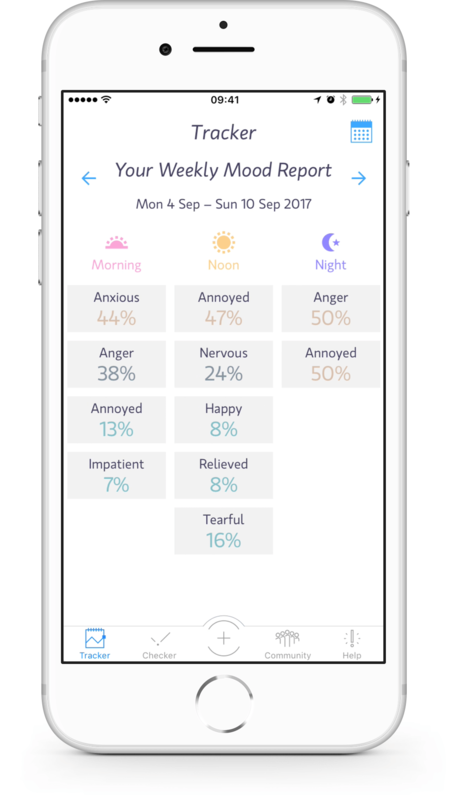 My friend Nuala is the driving force behind Moment Health, they’ve designed an app in partnership with mental health professionals where pregnant women can find more support for their mental wellbeing. There’s a checker where you can have a look and see if you’re showing any warning signs of antenatal or post-natal depression or anxiety. You can also track your emotions which is a great way to see if theres a pattern emerging and a visual tool to show you whether or not you might need some support. Personally I think a great use of this tool would be to actually take it along to your midwife appointment so you can show them how you’ve been feeling and don’t have to struggle to find the words yourself. One of the most important things Moment are building is the community, you can connect with and talk to women on the same journey as you. I’m in the group myself and it’s a really lovely mix of pregnant ladies, new mums and mums with toddlers and beyond. If you’re pregnant I really encourage you to download the iPhone app and start taking care of you today. If you’re not an Apple person don’t worry, it’s also available on Android. And if you’re reading this, nodding along as a mum who made the same mistakes as me, then spread the word about Moment. Tell your pregnant friends to take time for themselves today, ask them how they’re really doing and let’s make maternal mental health mainstream! This sounds like a wonderful app, it is so important to have people to talk to who are going through the same things you are at the same time. This is an amazing app! As someone that got PND depression and anxiety after having my second daughter this would have been brilliant for me. I especially love the idea of taking it along to the midwife to show them how you are feeling, as I definitely found it hard to get the words out.